Following years of development in NAND Flash and digital storage technologies, SSDs are now widely accepted by consumers on account of their superior speed and reliability, which have been consistently improved since these devices first arrived on the market. At the same time, more and more electronic brands are also entering the SSD market. With the overall quality NAND Flash chips reaching maturity and making it hard to differentiate them, controller ICs now play a decisive role in determining the performances of SSDs. The widespread adoption of SSDs has not only brought huge profits to the suppliers of NAND Flash memories but also lifted the revenues of the providers of SSD controllers. Going forward, the developments in controller solutions are expected to have an enormous influence over the penetration of SSDs in the consumer electronics market. Over the recent years, Taiwan-based branded suppliers have made innovations to the software algorithms and the multi-channel access technology, resulting in improvements to SSDs with respect to reliability, speed, and the lifespan of individual memory ICs. As NAND Flash suppliers raise the yield rates and production capacity of their 3D NAND Flash, controller providers will also continue to work on providing higher-specification solutions for the upcoming generations of SSDs. 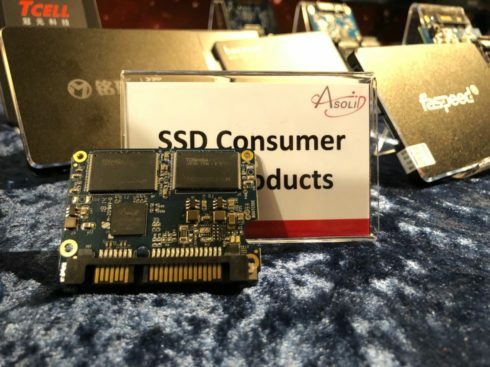 ASolid Technology Co. Ltd., one of the world’s top suppliers of NAND Flash controller ICs, has made a highly successful foray into the SSD market with the AS2258 SSD SATA 6Gbps Controller. This controller is designed to support NAND Flash storage devices with leverage of the latest 2D- and 3D-NAND Flash technologies. The AS2258 satisfies the high-speed read/write requirements for high-capacity systems and is compatible with varied NAND Flash standards (i.e. including both Toggle and ONFi). Furthermore, the AS2258 features built-in SDRAM and SMART technologies, while having no mechanical moving parts. Therefore, it offers the most economic and effective optimization for storage devices, whether these systems are for consumer or industrial grade applications. The same features on the controller also help minimizes power consumption and vibration. In terms of key specifications, the AS2258 has an embedded 32-bit microcontroller chip that provides superior wear-leveling and buffer management. It also allows power saving modes such as standby (partial), standard sleep, and DevSleep. As for its error correction capability, the AS2258 contains an ECC engine that uses LPDC to enhance the reliability of accessing and reading data. In addition, ASolid has developed a special advanced algorithm that can effectively prolong the lifespans of individual NAND Flash chips. Compared with competing products of the same class, ASolid’s AS2258 is leading ahead by a huge distance as it provides full-range support while pushing the capabilities of NAND Flash. This controller is thus another example of ASolid providing better cost-performance values plus immediate and highly efficient services for the industry. Based on latest hardware architecture, the AS2258 employs a 2-channel design that can support up to 16CE pins per channel. The controller also employs LDPC and RAID to protect stored data and increases the operational lifespan of the whole SSD device. Another key attribute that makes the AS2258 stands out among its competitors is the interoperability between NAND Flash standards. It works with ONFi 3.0, Toggle 2.0, and asynchronous NAND Flash. As for the voltage I/O interface, the controller natively supports both 1.2V and 1.8V. Although ASolid is somewhat a late entrant to the SSD controller market, its products score very high in the professional benchmark tests, such as AS SSD Benchmark and CrystalDiskMark. The AS2258 boasts the same incredible level of performances when working with different types of mainstream NAND Flash memories, from 2D-NAND to 3D-NAND, and from SLC to MLC, TLC, and even QLC. In sum, the AS2258 solution fits well with different subgroups of clients in the storage technology market. ▲ ASolid’s AS2258 controller posts impressive results in the well-known benchmark tests. From the standpoint of speed, the AS2258 reaches nearly the limits of SATA 6Gbps and delivers a very high 4K-IOPS. Compared with similar offerings from rival suppliers, ASolid’s AS2258 has no problem surpassing them in sequential read and write speeds, respectively peaking at 550MB/s and 500MB/s. For all advantages that it offers, the AS2258 actually has some of the lowest number of sub-components in the industry and requires no external DRAM chip (it has built-in SDRAM). The simplified yet effective layout of the controller can assist clients in reducing their BOM costs during product design. 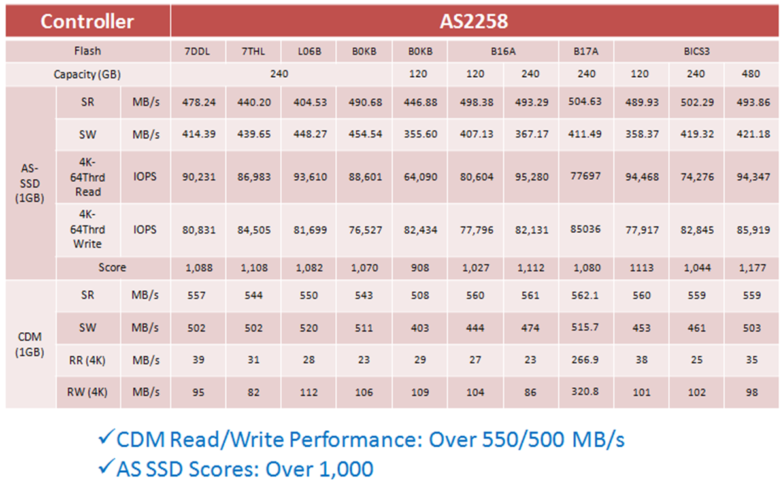 ▲ SSD with AS2258 achieves high scores in a CrystalDiskMark test (Left). The right image displays the test results of a SSD using a “DRAM-less” controller from another competing supplier. The above images are the results of a benchmark test to find out the speed performances of the AS2258 (left) and another controller of the same class from a rival supplier (right). With the NAND Flash specifications being equal (both controllers work with 3D-TLC NAND), the AS2258 is just much faster in every respect. Whether reading or writing, the ASS258 has recorded excellent results, especially in the 4K Q32T1 section where it is practically twice as fast as its competitor. Additionally, ASolid offers a variety of options in the PCB design for the AS2258, including the 2.5-inch, MO297, mSATA, and M2. Since clients have a lot of flexibility when choosing their layouts, they can significantly accelerate their product testing and shorten their production schedules as to seize the initiatives in the highly dynamic SSD market. ▲There are a variety of PCB designs to choose from for the AS2258 (from left to right – the 2.5-inch, MO297, mSATA, M2.2242, M2.2260, and M2.2280). ASolid offers a full range of follow-up services for their products. To provide immediate and effective technical support, the company has its experienced and capable R&D personnel deployed across a network of service locations in Taiwan and China’s Shenzhen. On the whole, ASolid AS2258 SSD SATA 6Gbps Controller features unique designs, advanced technologies, and innovative functions that bring out incredible performances from SSDs in terms of speed and efficiency. Already recognized for raising the competitiveness and cost-performance values of storage systems, the AS2258 has made a successful launch and is expected to remain as one of the most popular solutions in the SSD controller market.